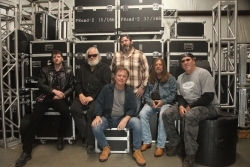 Morristown, NJ, February 25, 2019 --(PR.com)-- In celebration of the 50th Anniversary of the Allman Brothers Band, two former members of the legendary band, David Goldflies (78-82) and Johnny Neel (89-90) have joined forces with Gary Allman to launch A Brother's Revival, honoring their former band and it's music. During the past few months, they have developed the most authentic tribute show that includes the fans' favorite songs in their original format, just as they were performed when David and Johnny were touring with Gregg, Dickey, Butch and Jaimoe. The Allman Brothers Band was one of the most influential bands of the 70's, combining rock country, R&B and blues, creating a sound that was loved by millions of fans. This success helped to make Gregg Allman's legendary blues voice one of the most distinguishable in music. Few singers have the range and passion to successfully cover Gregg's music. A Brother's Revival is fortunate to feature the voice of lead singer Gary Allman, a cousin of Gregg's. His strong, bluesy voice delivers an "Allman" vocal reminiscent of Gregg's iconic sound. The band will be performing all of the Allman Brothers Band's fan favorites, including: Whipping Post In Memory of Elizabeth Reed, Southbound, Ramblin Man, Melissa, Jessica, One Way Out, Midnight Rider, Soulshine, Statesboro Blues, Good Clean Fun and of course, Revival. The song list will change from show to show, with unexpected jams added just as the Brother's always have done to keep the show exciting for their fans. Ultra Artists, LLC, the band's exclusive booking agency is putting tour dates together for the Summer and Fall.